Oslo, Norway- Just Another Nashville, Right? Meet Lars Haugen, country super-picker extraordiare! The fact that Lars isn't from Nashville or Bakersfield doesn't seem to matter much. He's from the country... of Norway, that is. But so what! Lars' high octane fretboard burnin' style is similar to the likes of Albert Lee, Steve Morse, Brent Mason and those 3 Hellacaster dudes. Any guitar player of any style is gonna appreciate this level of playing. Maybe Lars got tired of shoveling snow up there during those cold Norwegian winters, and decided he was gonna melt off that driveway with his guitar licks. "Hot Damn Buddy Buddy!! Lookee that!!" (Lubbock, Norway accent) Has Willie Nelson ever been spotted in Norway? He shows up just about everywhere else. And then there's the guitar. I found a few photos of Lars with his Tele, but the one pictured here is most puzzling indeed*. 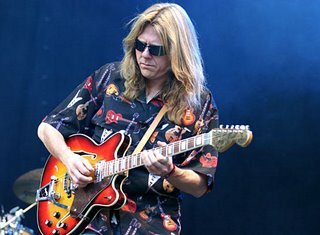 Fender once made a 335 competitor called the Starcaster, but looking at Starcaster photos revealed too many differences between Lars' guitar and a Starcaster. Close inspection determined his headstock to indeed be a Fender, but the Starcaster headstock shape was not the standard Strat shape we see here. The rectangular position markers aren't Fender, at least not in any Starcaster images I found. 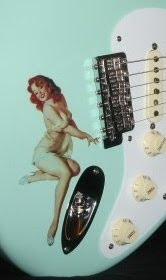 The body cutaways are different, the pickups & trem-- all different. A guitar as mysterious as Lars himself. I coulda just messaged Lars to find out about it, but instead I'll save it for another post. OR, you could hook up with Lars yourself and solve this mystery.